Preheat oven to 170c. Brush the trout with olive oil and salt flakes, and bake until just cooked through. Chill, and carefully remove the flesh from the trout- discarding the bones and skin. Peel the potatoes and place into cold salted water. Bring to the boil and simmer until cooked through. Steam dry, and mash while still hot. Sautee the leeks in the butter and a little oil until soft, add the thyme and cook for another few minutes. Mix the trout flesh, onion mix and truffle into the mash. Season with salt flakes, pink pepper corns and cool. 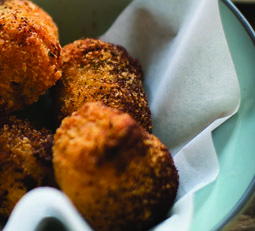 When cool roll into little sausage shapes coat in flour, then dip into egg then coat in panko crumbs. Deep fry at 180 degrees until golden brown. Finish with a little more pink pepper and shaved truffle, serve immediately with baby leaves and/or a light mayonnaise.